Hey everyone, this is the new auxiliary weapon coming to TSW in patch 1.2! It is the Rocket Launcher. Here is a list of the 7 abilities this new auxiliary weapon will have! More info on this weapon will be updated as they become available. 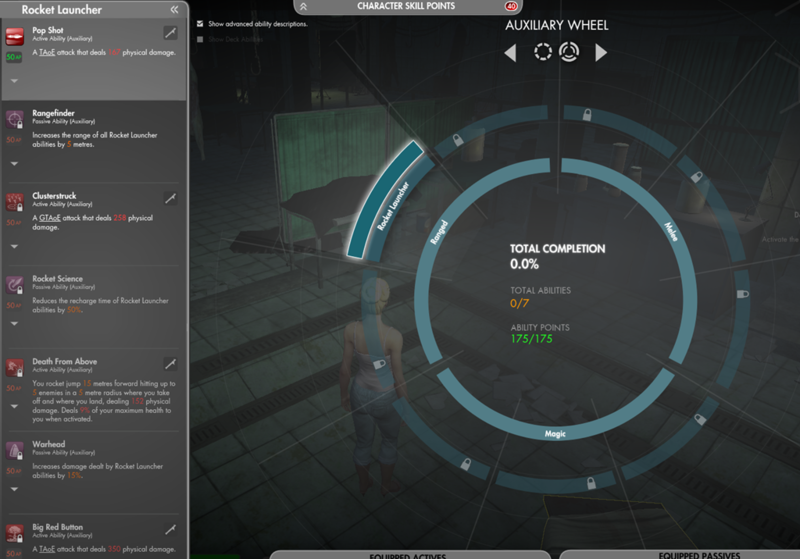 Here is the screenshot of the Auxiliary Wheel, Rocket Launcher is the first auxiliary weapon available in patch 1.2, others might come at a later date. Note that like other wheels, you must purchase the abilities before it before you can unlock the bottom ones. Each ability will cost 50 AP and there is a specific slot (#8 on your hotbar, not available yet) where these auxiliary weapon abilities will go on your active and passive bar. Auxiliary weapon abilities can not be placed on the first 7 slots (i.e. you are limited to 1 passive and 1 active auxiliary weapon ability). This will enable you to carry a maximum of 3 weapons. The hate for that f**king quest has its own thread on the official forums, haha. I get that Rocket Launcher abilities can only go in slot #8. But can slot #8 only take Rocket Launcher abilities, or is this an open thing for building? * Players can now equip an 8th active/passive ability! 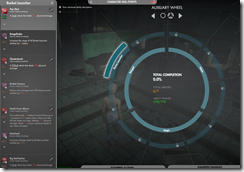 – Auxiliary abilities cannot be placed in the other 7 slots. – Added hotkey support for 8th ability. 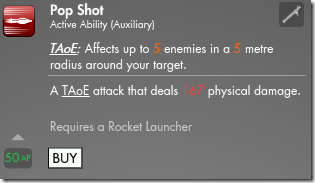 Light, I assume that rocket launcher and other auxillary weapons are not equippable. Which is kind of sad, because you can’t modify the weapon’s model.